For speed of loading/viewing and to detract from pirated images, Greg Myhra adopted a universal file size of 300 pixels maximum for showing his photographs. Occasionally this will make an image appear soft or out of focus. Rest assured that this is due to monitor screen resolution and has no bearing on what your final print will look like. All of the photographs available at Greg Myhra Photography are digitally printed from high resolution scans of the original negatives and transparencies. These professional quality, archival pigment inkjet prints have the ability to hold more detail and nuance than traditional darkroom prints and with proper handling, are as archival - and usually more so. With digital printing gaining acceptance in the fine art community, Greg finds himself exactly where he wants to be. "I am able to utilize all of my pre-press knowledge from past experience and apply it to making archival fine art digital prints. It's a language I can interpret fluently to the final printed piece." Images are printed with the highest quality archival pigment inks on a variety of archival paper stocks. 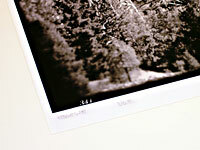 Many color and toned black and white images are printed on Kodak or Epson Premium lustre or semi-gloss papers. 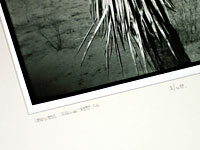 Pure black and white prints often are on Hahnemuhle, Moab or Ink Press Photo Rag papers. Fine art images are available as limited editions. 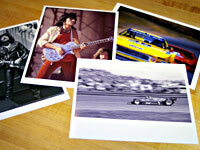 Rock concert and auto racing photos are available both unlimited and as sequentially numbered open editions. Print size always means the actual paper that an image is printed on. Image size will always be smaller than the paper size. No borderless prints are offered by Greg Myhra Photography. An image does not always proportion exactly to the paper size. In those cases the image is made as large as the paper will allow. 1) Images from the Rock & Roll and Motorsports collections will be made as large as possible to proportionally fit the paper size while allowing for a 1/4" to 1/2" border at the image's longest dimension. This could mean an image area of 7x13" on an 11x14" sheet as well as an image filling an 11x14 sheet with a 1/4" border. b) Enough border needs to be present to allow photo corners to remain unseen from window mat. Greg Myhra Photography prides itself on providing its customers with top quality archival matting. 4 ply window mat boards are used for finished sizes of 11x14" and smaller. 8 ply window mat boards are used on 16x20" and larger. Greg's preferred mat board is Light Impressions' Exeter Conservation Board in Gallery White finish, which has a slight warm tone. If this is not available, an equally archival board choice will be substituted. The window mat will either overlay or float the image. An overlay will come up to, or slightly come into, the image area. A floating mat does not come into contact with the image area, leaving some space around it to provide an additional border. Top and bottom mats are hinged with archivally neutral linen tape. 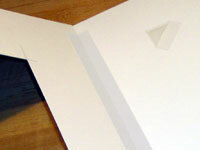 Clear archival photo mounting corners are used to secure print to bottom mat. A floating mat ends away from image area and an overlay mat stops within image area. Effective April 1st, 2006, Greg Myhra will produce only limited editions of his fine art photography. The exception will be in the Delicious Noise category. For clarity, a limited edition refers to an image printed to a specific size using a specific media, i.e. an 11x14" archival pigment inkjet print and a 16x20" platinum/palladium print would be two different editions. There will also be from 1 to 3 Artist Proofs made per image. Limited edition prints will be titled, numbered and signed by the artist. Depending on the print surface, this will be done lightly in pencil or with a fine tipped permanent ink pen. Some or all of this same info may also be printed on the window mat. The price of the edition increases as the edition sells out. Existing open edition prints will be treated as part of the limited edition. Using the example of an edition of 15, whatever print number you have will be considered that numeral in the limited edition, i.e. print 1/O.E. will be thought of as 1/15, with the next print produced being 2/15, etc. Images in the Delicious Noise category will continue to be available as open editions. 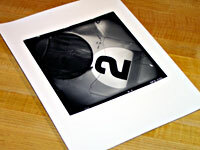 Open edition fine art prints are sequentially numbered (i.e. 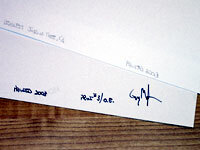 #6/OE; equals print 6 of an open edition), signed, dated and titled. Depending on the print surface, this will be done lightly in pencil or with a fine tipped permanent ink pen. Some or all of this same info may also be printed on the window mat. Open editions allow more people an opportunity to own a photograph than could under a limited edition structure. Open editions neither limit the image nor ignore the importance of time in the production of the photograph or in the maturing and creative vision of the photographic artist. To collectors, numbering the print in this fashion allows recognition of the older print without denying the photographer the opportunity to refine his or her vision or execution of the negative. Edition details are written on verso of print. Pencil or fine tipped pen is used. Edition details may also be printed on window mat. If a floating mat is used, edition details may be printed near image instead of on mat. With proper care an archival digital print should survive intact for at least 100 years. Like all works on paper, it is subject to possible adverse effects from mishandling and environmental pollutants. The most common enemies of fine art photographs are prolonged exposure to direct sunlight, excessive handling, indoor smoke (from cigarettes, etc. ), prolonged high humidity and direct contact with acidic substances. Common acidic substances to avoid are manila envelopes, most colored mat boards and scrap book papers. It's best to keep your prints framed, or protected in either polyethylene or polypropylene plastic bags or an acid free envelope.  Limit the amount of sunlight or bright light that falls directly on your finished artwork.  Avoid leaving prints in direct sunlight, enclosed cars, near heaters or hung over fireplaces.  Prints should be stored and displayed in a comfortable climate-controlled environment.  Handle prints as little as possible. If you must handle them, do so by the edges of the print, and preferably with cotton gloves on. The oils and salts in the skin can damage and age the print prematurely. Too much handling increases the chance of tearing, creasing or otherwise damaging the paper. Do not allow prints to come in contact with liquids.  Use an acid free or museum matboard. Avoid using regular mat boards as they can emit gasses that are detrimental to the print. Using a top window mat keeps the print surface from coming in contact with the glazing.  Greg prefers glazing with clear acrylic or Plexiglas to glass due to its clarity, light weight and safety (it won't shatter like glass). UV filtered glazing provides additional protection. Avoid using non-glare glass products as the chemical process of the etching may attack the digital print over time. 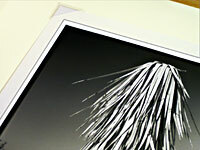  DO NOT USE dry mounting tissues to mount digital prints; they may discolor the print, or worse. DO USE archival photo mounting corners, similar to those shown above in Matting the Prints.  Avoid leaving prints in uncontrolled climate conditions like attics, basements and garages.  For photo albums, look for one that uses acid free paper pages and photo mounting corners or plastic pages made from stable polypropylene or polyethylene. DO NOT USE any album that uses PVC - polyvinyl chloride - plastic pages. This material is common in many inexpensive albums. Avoid using albums that have adhesive pages.  For long term safe storage, keep your prints in an envelope or sleeve made of acid free paper, polypropylene or polyethylene. Alternately you may store them in acid free boxes, with the prints separated by archival interleaving papers or tissues. 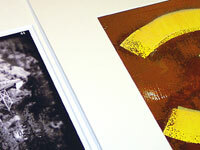 1) Every image is available as an affordable unlimited and unsigned print. 2) Matted; These same prints are available matted, ready for you to frame. 3) Delicious Noise; A select group of Rock & Roll and Motorsports images are available as a premier Fine Art Open Edition. Prints are numbered, signed, titled and dated. All prints in this collection are archivally matted. The top window mat is also titled, signed and numbered.